This is my Parfait dress, made during my first year of sewing and still going strong! The straps and gored skirt make this really cool to wear and the double gauze is light and breathable. I was also hoping to pack my Simplicity sundress, but sadly I ruined it in the wash - the blue linen-look cotton ran into the white bodice band. Now, instead of being snowy white, the band is a lovely shade of dishcloth grey. I pre-washed both fabrics, but the blue fabric obviously had a bit more dye to get rid of - so annoying as I loved that dress. 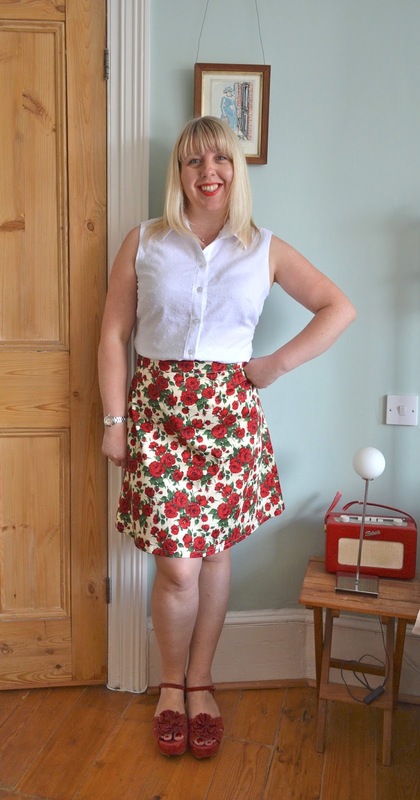 And my floral A-line skirt from a vintage pattern. I refashioned this skirt a couple of years ago (shortened it and removed the waistband), and as it's made from very thin cotton lawn, it's now an ideal holiday skirt. Gertie Capri pants, perfect for evenings teamed with a top and sandals. I have no idea who the cowboy hat dude is! Sleeveless Granville - goes with absolutely everything. 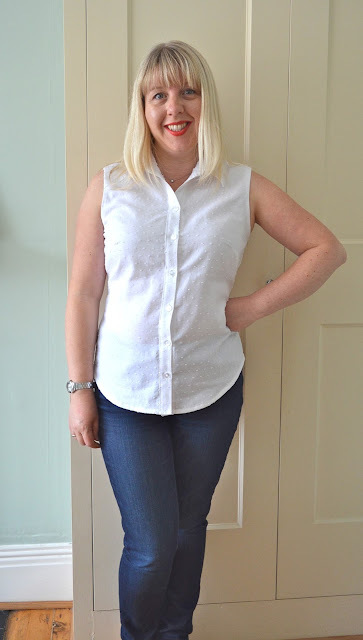 A toned down version of the Simplicity 2154 bow blouse. It pairs up perfectly with lots of my denim or blue coloured bottom halves. I can also undo the necktie if it gets too constricting. The new Fifi set from Tilly and the Buttons. Comfortable and pretty - perfect for hot summer nights! This is a very easy tutorial for turning a shirt into a cushion. I decided to try this out after making a memory quilt from my uncle's shirts. There were a few shirts left over and it seemed a shame not to use them up… so I made them into cushions instead. Any shirt would do for this project but men's shirts work particularly well as they're larger, so you have more fabric to play with. And when I say this project is easy, I'm not kidding - it's quite literally sewing two squares of fabric together! The width of the shirt will determine the size of the cushion insert, so choose one that's roughly the same width. The key is to sew the cushion cover slightly smaller than the cushion insert. This way you get a lovely plump looking cushion instead of a baggy one. To work out the size of your cushion squares, deduct 5cm from the width of the cushion insert, then add 2cm for seam allowances. This cushion has a 50cm insert, minus 5cm = 45cm, plus 2cm seam allowance = 47cm square. 1. Lay your buttoned up shirt flat and smooth out any creases. 2. On the front shirt section measure out your desired width from underarm to underarm (in my case 47cms), making sure the button band is centred. Measure the same distance down the length of the shirt. 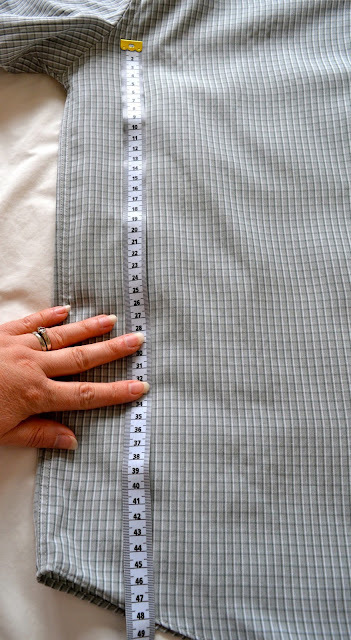 If the hem is curved, then the bottom of the square should finish before the curve starts. The square should finish before the hem starts dipping down. 3. Cut this square out. Then cut a square exactly the same size from the back shirt piece. 4. Place the two squares right sides together and pin. The front piece should still be buttoned up at this point - don't panic, you'll still be able to open the buttons once it's sewn! 5. Sew around all four sides using a 1cm seam allowance. Snip the corners diagonally. 6. Undo a few buttons from the button band and turn the cushion right side out. Poke the corners out so they're nice and pointy and give the cushion cover a press. 7. Open all the buttons on the button band and insert your cushion pad. It will probably be a tight fit, but that's what you're after! This is the view from the front - the buttons are on the other side. And here it is with another one I prepared earlier! This is a quick, fun project and a good way to refashion an old shirt. As always, if there's anything that doesn't make sense or is unclear about this tutorial, please let me know in the comments section. When I helped my friend Berni make a quilt from her late brother's shirts last year, I had no idea I'd be making a similar quilt myself a year later. It's been a long, sad process but I'm pleased that it's finally finished and I can hand the quilt over to the recipient. This quilt was made from my beloved Uncle Herrick's shirts and is for his partner - Chris. 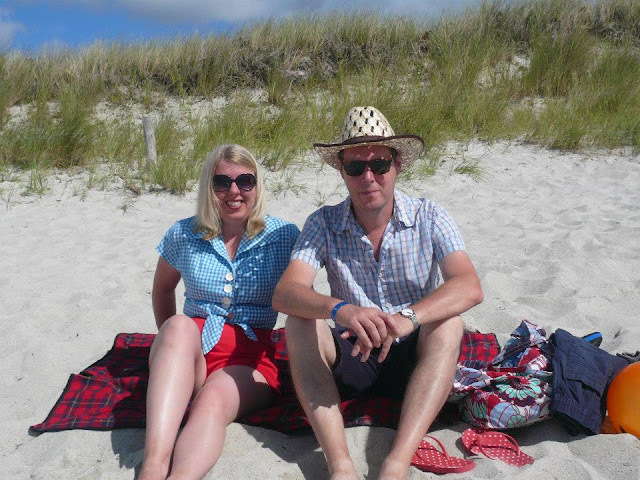 Herrick died suddenly 18 months ago, which was a terrible shock for the whole family. I offered to make Chris a memory quilt of her own as I knew she'd get a lot of comfort from it, but even so, I had no idea how difficult it was going to be. Chris gave me the shirts at New Year (exactly a year after Herrick's death), but it took me about four months to pluck up the courage to even open the bags. I did open them eventually, and after lots of blubbing I finally started cutting out the squares for his quilt. This was the longest part of the whole process, partly because it was so emotional and I had to keep putting it away, but also because cutting up enough shirts for a sizeable quilt just takes ages. There were a few shirts left over so I made two of them into cushions as a little extra gift for Chris. They were super easy to make - look out for a tutorial on how to make them soon. The finished quilt is large enough for a double bed and measures around 64" x 74". It's made up of 5" squares from as many different colours as I could find amongst his shirts. I decided to lay out the quilt top as a random design, which was actually quite a departure for me (in case you haven't noticed, I like things to be symmetrical, colour co-ordinated and lined up!) My only rule when laying out the patchwork squares was that no two squares of the same colour should lie next to each other. Sewing up the patchwork top was very straight forward, helped by my favourite new haberdashery purchase - Aurifil quilting thread from M is for Make. This high quality thread is fab - there were fewer instances of snarled up knots when sewing the squares together and it gave a lovely, precise finish to the top stitching. The backing is just a plain, red cotton sheet (Chris wanted a red quilt back as Herrick was a lifelong Liverpool supporter) and the binding is the same blue and white striped binding I used for my son Charlie's quilt. The brown square is from Herrick's work satchel - Chris had it personalised with his initials some years ago. And this little Liverpool badge is from one of his football tops. The top wasn't suitable for using in the quilt but the badge was, so I unpicked it and sewed it onto the quilt back. For the actual quilting, I sewed ¼" either side of each square, which gives a nice, neat effect on both sides. I won't say too much about Herrick, as thinking about him still sets me off in floods of tears. He was only 15 years older than me, so was more like an older brother than an uncle and the funniest man I knew. There are so many little things that make me remember him…. I'll remember him whenever I see a terrible zombie film (watching Plan Nine from Outer Space with him was the time I laughed most in my entire life), I'll remember him when I hear the theme tune to Inspector Morse. I'll remember him when I see a copy of Tess of the D'Urbervilles. And I'll especially remember him whenever I hear Fagin's throwaway line in Oliver!, "Shut up and drink your gin." I miss him terribly. My springtime Granville shirt has become a real wardrobe staple these past few weeks - it's such a classic style and I really like the fitted, yet comfortable shape. Key word here - comfortable! Everybody knows I'm a giant fan of a super-fitted, collared shirt (if you need proof, see my five versions of Simplicity 4238), but I have to admit, the trillions of darts around the waist do feel a bit restrictive as the day moves on and more and more cakes are consumed. 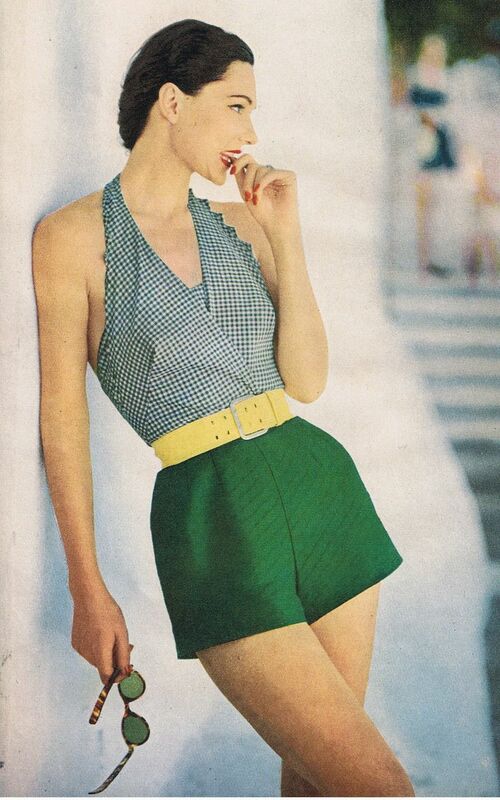 The advantage of the Granville pattern is that there are no waist darts (as opposed to eight in Simplicity 4238!) but you can still achieve a lovely fitted silhouette thanks to the shaped side seams and princess seams on the back bodice. So I decided to make a lightweight, sleeveless version of the Granville shirt to wear during hot, summer days. The fabric I used was a white Swiss Dot Cotton from Fabric Godmother, which Josie kindly sent me to review. I deliberately chose a very lightweight fabric as I wanted this version to be suitable for hot weather. The fabric is beautifully light, but the flip side is that it's also totally transparent. I'm not a camisole wearer and don't like having a visible bra on display so I knew I'd have to underline the whole shirt. Initially I planned to underline it with silk cotton, but the white silk cotton in my stash is just slightly off white. 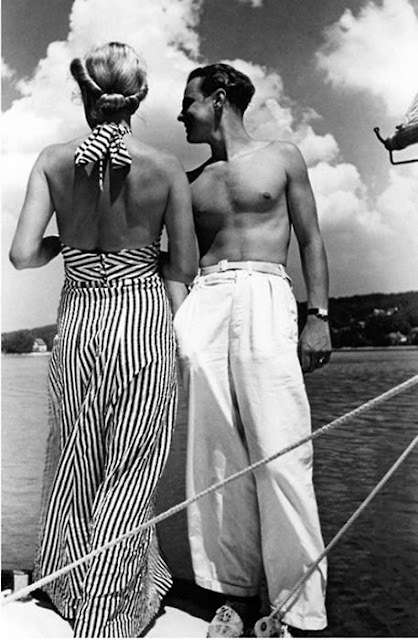 The Swiss Dot fabric is a bright, brilliant white, so I underlined it with a layer of light cotton muslin which was exactly the same shade. 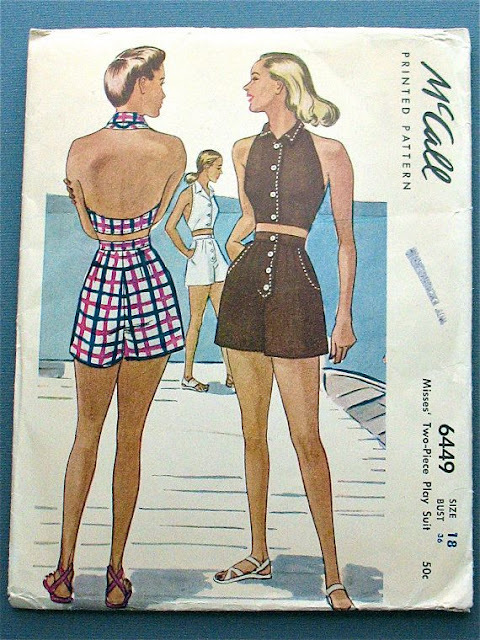 You can see from the photo above what a difference there is between a regular pattern piece and one that's been underlined. This solves the transparency issue and because both fabrics are so light, the garment still feels very drapey and breathable. My scissors struggled a tiny bit cutting through some of the raised 'dots', so make sure yours are nice and sharp if you're working with this fabric. I could also feel the needle going over the dots as I was sewing, but the stitches didn't distort which I was pleased about. I used Entomology Pins throughout, which are great when working with fine fabrics. They are quite long and sharp though, so be careful you don't prick your finger and drip blood! I'm only saying this because as I was completing the final few stitches on this shirt and congratulating myself on avoiding a pricked finger mishap, I realised to my horror that I was having a nosebleed. A nosebleed!! The last time I had a nosebleed was about forty years ago for goodness sake! By an absolute miracle, I managed to avoid dripping blood all over the shirt but I'm not quite sure how. I know it's only a matter of time before I spill a whole plate of tomato sauce right down my front - just you wait! Back to the sewing - if you're planning a sleeveless Granville yourself, you'll need to make some slight modifications to the armhole and yoke pieces to convert the original pattern to a sleeveless version. 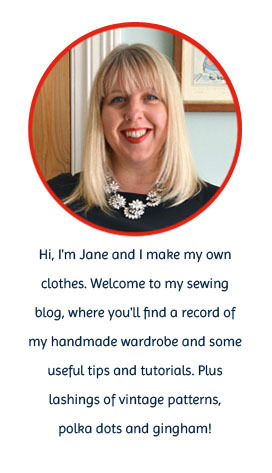 This was very simple to do and I used this excellent tutorial from Grainline Studio, which Tasia recommended when she made her own sleeveless version. Sewing this shirt was pretty straight forward and I took my time sewing it which was a good thing - sewing shirts shouldn't be rushed! The step that really flummoxed me last time was sewing the collar, so this time round I tried a different approach and followed Andrea's collar tutorial at Four Square Walls. She constructs the collar in a different order to the instructions, and for me personally, it made a lot more sense and gave a neater, more professional look to the collar. Thanks Andrea! As the fabric is so lightweight, I spent a bit of time making sure the finish of this shirt was really neat. The side seams and princess seams are French seamed and the armholes are finished with vintage white bias binding - no raw seams on display! I even slip stitched the armhole binding to the underlining so there was no show through on the right side of the shirt. Yep, you read that correctly, hand stitching, through choice! I think the heat was getting to me by this point! Easy to tuck in - yay! It seems I may have to rethink my Vintage Pattern Pledge. I thought I was so clever pledging to sew just one vintage pattern this year. 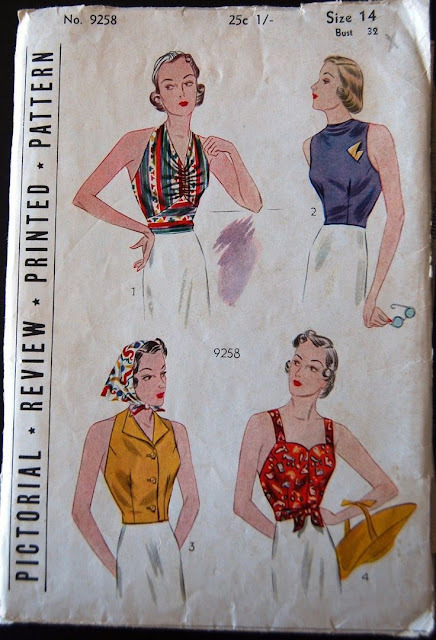 My mistake was specifying the exact pattern (a 1950's tie neck halter top) as I now don't want to sew it! 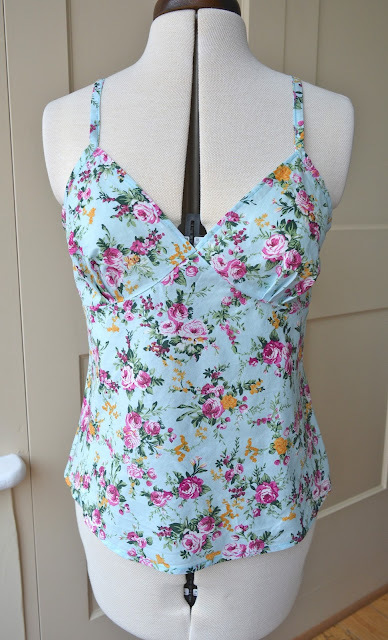 The halter neck reproduction pattern I chose is an absolute beaut with some lovely vintage details: a gathered bustline and crossover back finished with bias binding round the edges. 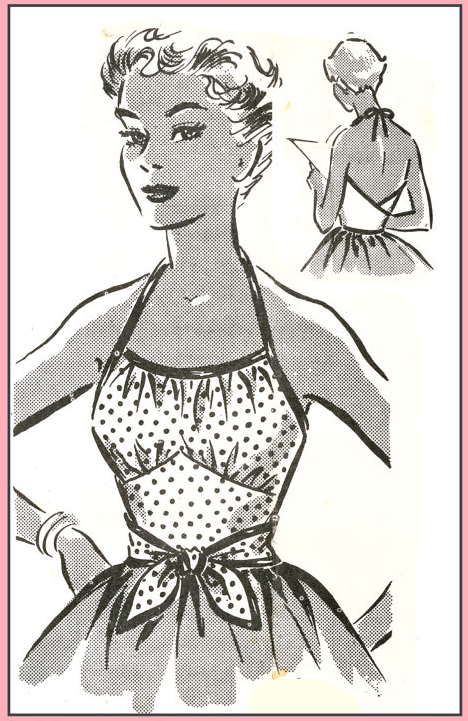 It seemed like a no-brainer at the time, the problem is that I hardly ever wear halter necks. That doesn't mean I dislike halter neck styles, I love them, absolutely love them. They're chic and classy and look so elegant if you have a slim, golden back. 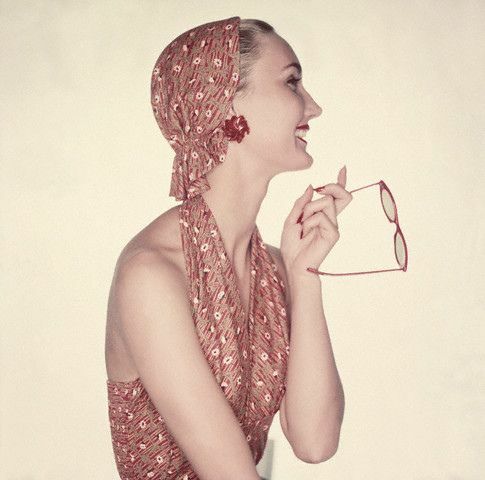 In reality, the neck ties end up giving me a headache, my back is NOT slim, elegant and golden, and finding an appropriate bra is always a pain. 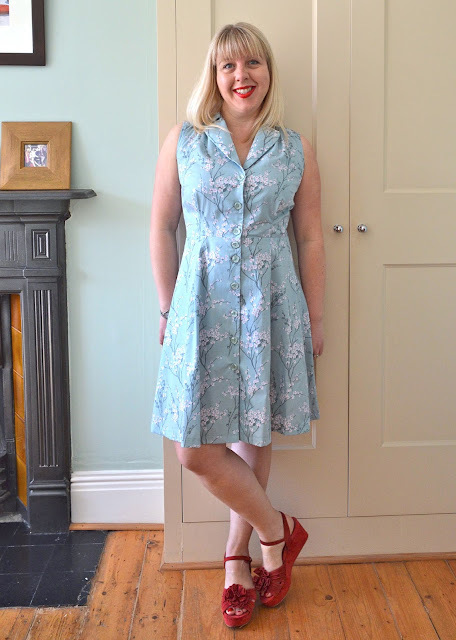 I've made just one halter neck garment - my Cherry Fabulous dress - which was a success, but I have to feel pretty confident (and brown!) to wear it. 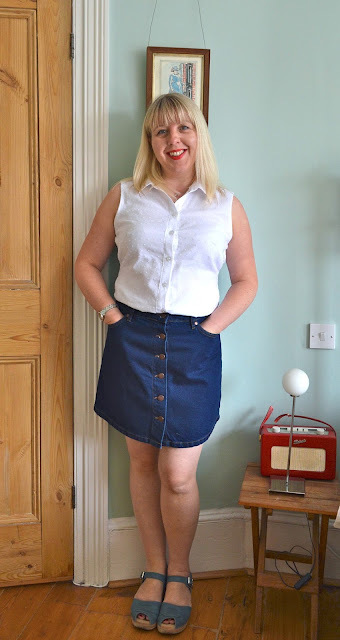 As there's only a small window of time for wearing halter necks in the UK, it didn't seem like a sensible use of my sewing time to make something that would hardly ever be worn. So much as it pains me to do so, I've decided to be sensible and abandon the original pledge. I've already made two garments from vintage patterns this year (here and here) and I'm sure there'll be a couple more before the year is out. I'll leave the pledge open for now and see how many more I manage to notch up. In the meantime, I can always dream….